When applied to the brain, nuclear medicine techniques reveal critical information about the progression of the most devastating diseases, from Alzheimer’s to traumatic brain injury. Just last week, Nature published research showing that brain imaging might be able to help diagnose autism in infants as young as six months old, an advance that would represent extraordinary progress in more effectively treating the disease. Such advances don’t surprise Robert S. Miletich, MD, PhD, interim chair and professor of the Department of Nuclear Medicine at the Jacobs School of Medicine and Biomedical Sciences at the University at Buffalo, who is studying brain scans obtained from 16,000 patients. 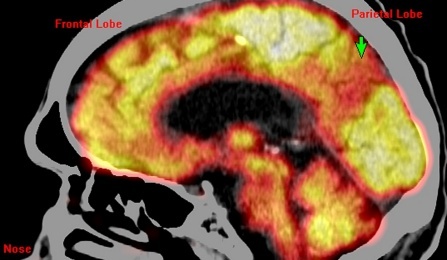 He says the wealth of information nuclear imaging techniques provide could pave the way toward a dramatic improvement in the clinical detection and treatment of many brain disorders. Image of glucose metabolism PET overlaid on CT in an Alzheimer's patient with mild dementia. Green arrow points to regional hypometabolism in the medial parietal lobe, (which processes biographical information and memory),a proposed biomarker for Alzheimer’s. “I predict that nuclear neurology is going to become as important to neuroscience as nuclear cardiology has been to cardiology,” he said. Miletich, who is board-certified in nuclear medicine, uses these techniques to image disorders ranging from brain tumors, traumatic brain injury and epilepsy to transient ischemic attacks, various forms of dementia and movement disorders like Parkinson’s as well as mental illnesses, including depression, anxiety disorders and schizophrenia. Miletich compared potential advances in the study of brain diseases that could result from nuclear neurology to the advances of the 1980s and 1990s that dramatically affected cardiovascular diagnoses and treatment. “The application of nuclear imaging to the diagnosis and treatment of heart disease led to a new standard of care for cardiology,” said Miletich, noting that cardiologists now routinely use techniques like single photon emission computed tomography (SPECT), positron emission tomography (PET) and computed tomography (CT) for the early detection of structural and electrical defects in the heart. In presentations at the Society for Neuroscience and in a review article published last fall in the American Academy of Neurology journal, Continuum, he described his application of these techniques to specific brain disorders. Miletich said that nuclear medicine techniques exist to reveal both general regional physiology, such as glucose metabolism or blood perfusion, and specific neurochemical physiology, such as the status of the brain dopamine system. Such information is useful in the care of patients with disorders ranging from strokes to dementia. The brain scans he studies were obtained over more than two decades from 16,000 individual patients, mostly from Western New York. The patients range from juveniles to the elderly. “There are cases, such as in traumatic brain injury, where commonly used techniques, like CT and MRI show no abnormalities, but where a patient continues to be profoundly compromised in his or her daily life,” he said. “In those cases, cerebral perfusion SPECT and glucose metabolism PET/CT can reveal exactly where in the brain the injury is located and the extent of damage to the brain. “When I image the brain with SPECT or PET/CT, I can see disorders long before they have fully developed. I can see Alzheimer’s before the patient has dementia. This will facilitate the development of abortive therapy for Alzheimer’s,” said Miletich.